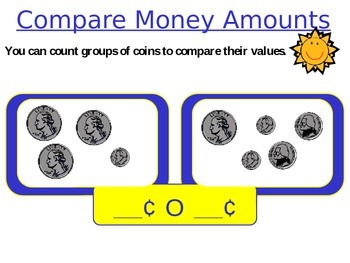 This is a PowerPoint math lesson that gives students the opportunity to compare total money amounts, using quarters, dimes, nickels, and pennies. 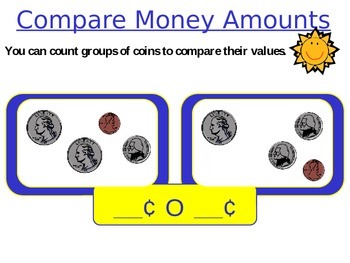 It provides real world practice, as they add two separate combinations of coins and then decide which is the greater amount. 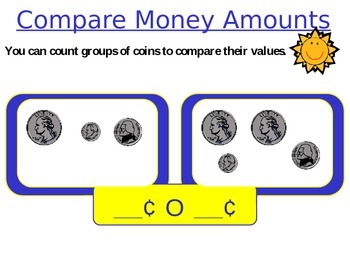 This could be used as a math mini-lesson or a center activity. 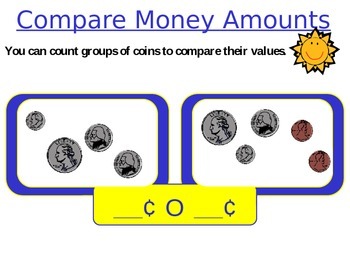 Featuring kid-friendly graphics and teacher-friendly PowerPoint controls, this is a great resource for teaching your primary students to money.